The Uvex Genesis Black Frames with the Light SCT Blue Lens are outstanding. 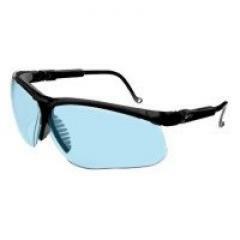 They provide protection for you eyes in the street while on Patrol or at the Practice Range. To me they brighten up your sight picture, making it easier to acquire your target. The adjustable arms help with a perfect fit on your face. Great Law Enforcement glasses guys This is my third pair.